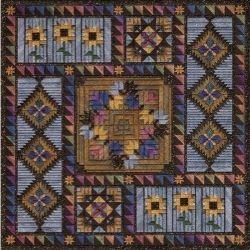 Design Area: 8.11" x 8.11" ~ Materials List: 12" x 12" 18 Ct Canvas, Sandstone ~ 12" x 12" Stretcher Bars ~ Japanese Tacks ~ #22 Tapestry Needle ~ Caron Collection Snow, 21 Storm(1 uses almost all), 16 Gunmetal(1) Caron Collection Watercolours, 157 Polar Ice(1), 163 Plum (1 uses almost all) ~ DMC #5 Perle, 823 Dark Navy Blue (1 uses almost all), DMC Color Variations #5 Perle, 4010 Winter Sky(1) ~ Rainbow Gallery Gold Rush 18, GD10C White Pearl (2), Rainbow Gallery Entice E263 Sky Blue(1) WG60C BABY BLUE GOLD RUSH MENTIONED IN THE CHART HAS BEEN DISCONTINUED USE E263 INSTEAD. We have used E263 Entice in the thread kit. # in () indicates number of skeins, spools or cards needed. Design Area: 4.00" x 8.00" ~ Materials List: 8" x 12" 18 Ct Zweigart Canvas (Sandstone) ~ 8" x 12" Stretcher Bars ~ Japanese Tacks ~ #22 & #26 Tapestry Needles ~ Caron Collection Watercolours, 047 Camouflage(2), 063 Black Forest(2) 164 Cinnabar(1), 220 Cheyenne(1), 231 Ethiopia(1) ~ DMC #5 Perle Cotton, 341 Light Blue Violet(1), 822 Light Beige Gray ~ DMC Floss, 720 Dark Orange Spice(1), 920 Medium Copper(1), 922 Light Copper(1), 977 Light Golden Brown(1). # in () indicates number of skeins, cards or spools needed. 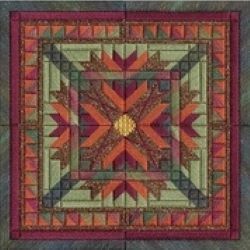 Design Area: 4.00" x 8.00" ~ Materials List: 8" x 12" 18 Ct Zweigart Canvas (Sandstone) ~ 8" x 12" Stretcher Bars ~ Japanese Tacks ~ #22 & #26 Tapestry Needles ~ Caron Watercolours, 032 Passion(1), 070 Cranberry(1), 133 Delphinium(1) ~ DMC #5 Perle Cotton, Ecru(1), 310 Black(1), 729 Medium Old Gold(1), 3348 Light Yellow Green(1), DMC Color Variations #5 Perle Cotton, 4045 Evergreen(1), DMC Floss, 310 Black(1) ~ Rainbow Gallery Overture, V59 Bayou(1). # in () indicates number of skeins, cards or spools needed. Design Area: 4.00" x 8.00" ~ Materials List: 8" x 12" 18 Ct Zweigart Canvas (Sandstone) ~ 8" x 12" Stretcher Bars ~ Japanese Tacks ~ #22 & #26 Tapestry Needles ~ Caron Watercolours, 028 Confetti(1), 079 Cantaloupe(1), 165 Granite(1), 225 Walnut(1), 254 Porcelain Blue(1) ~ DMC #5 Perle Cotton, 367 Dark Pistachio Green(1), 746 Off White(1), 823 Dark Navy Blue(1) DMC Floss 742 Light Tangerine(1), 823 Dark Navy Blue(1) ~ Kreinik #12 Tapestry Braid, 095 Starburst(1) ~ Rainbow Gallery Overture, V119 Bouquet(1). # in () indicates number of skeins, cards or spools needed. Design Area: 4.00" x 8.00" ~ Materials List: 8" x 12" 18 Ct Zweigart Canvas (Sandstone) ~ 8" x 12" Stretcher Bars ~ Japanese Tacks ~ #22 & #26 Tapestry Needles ~ Caron Collection Snow, 00 White(1), 09 Silver(1) ~ Caron Collection Watercolours, 047 Camouflage(1), 063 Black Forest(1) 137 Copper(1), 159 Silver Blue(1), 299 Dense Fog(1) ~ DMC #5 Perle Cotton, 3347 Medium Yellow Green(1) ~ DMC Floss, 3371 Black Brown(1) ~ Kreinik #12 Tapestry Braid, 3202 Cat's Eye (1). # in () indicates number of skeins, cards or spools needed. 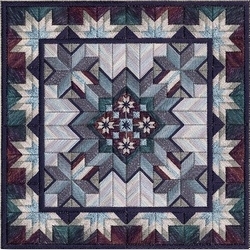 There are three color choices in this pattern. 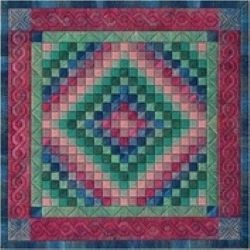 Design Area: 9.67" x 9.67" ~ Materials List: 14" x 14" 18 Ct Canvas Brown ~ 14" x 14" Stretcher Bars ~ Japanese Tacks ~ #22 Tapestry Needle ~ Color Design #1 Antique Jewel Tones (shown in picture) ~ Caron Watercolours, 083 Pine Forest(1), 121 Evergreen(1), 158 Grape(2), 160 Night Sky(1), 162 Periwinkle(1) ~ DMC #5 Perle, 316 Antique Mauve(1), 926 Grey Green(1), 991 Aquamarine(1), 3041 Antique Violet(1). Color Design #2 Earth Tones ~ Caron Watercolours, 047 Camouflage(2), 083 Pine Forest(1), 137 Copper(1), 173 Redwood(1), 196 Sable(1) ~ DMC #5 Perle, 221 Shell Pink(1), 436 Tan(1), 801 Coffee Brown(1), 3346 Hunter Green(1). Color Design #3 Bright Jewel Tones ~ Caron Watercolours, 037 Fuchsia(2), 041 Blueberry(1), 068 Mediterranean(1), 209 Iris(1), DMC #5 Perle, 333 Violet Blue(1), 602 Cranberry(1) OR 3688 Mauve(1), 915 Plum(1), 996 Electric Blue(1), 3814 Aquamarine(1). #in () indicate the number of skeins or cards needed. 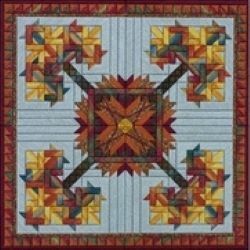 Design Area: 9.78" x 9.78" ~ Materials List: 14" x 14" 18 Ct Canvas, Sandstone ~ 14" x 14" Stretcher Bars ~ Japanese Tacks ~ #22 Tapestry Needle ~ Caron Collection Watercolours, 195 Paprika(1), 223 Rye(1), 232 African Violet(2), 244 Olive Grove(1), 286 Aubergine(1), 287 Seaweed(1) ~ DMC #5 Perle Cotton, 550 Dark Purple(1) ~ Rainbow Gallery Silk Lame', SL28(2 uses ALL of 1), SL55(2). # in () indicates the number of skeins or cards needed. 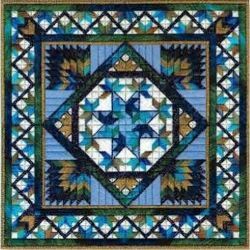 Design Area: 9.11" x 9.11" ~ Materials List: 14" x 14" 18Ct Canvas, Sandstone ~ 14" x 14" Stretcher Bars ~ Japanese Tacks ~ #22 Tapestry Needle ~ Caron Watercolours, 010 Fiesta(1), 047 Camouflage(1), 063 Black Forest(1) ~ DMC #5 Perle, 902 Very Dark Garnet(1), 920 Medium Copper(1), 927 Light Gray Green(2) ~ Rainbow Gallery, Gold Rush 18 GD9C Copper(2) ~ Weeks Dye Works #5 Perle, P51224 Amber (2). #in () indicates number of skeins or cards needed. Design Area: 6.33" x 6.33" ~ Materials List: 10" x 10" 18ct Canvas, Sandstone ~ 10" x 10" Stretcher Bars ~ Japanese Tacks ~ #22 Tapestry Needle ~ Caron Watercolours, 047 Camouflage(1), 063 Black Forest(1) ~ DMC #5 Perle Cotton, 902 Very Dark Garnet(1), 920 Medium Copper(1), 3052 Medium Green Gray(1) ~ Rainbow Gallery Gold Rush 18 GD9C Copper(2), Weeks Dye Works #5 Perle Cotton, P51224 Amber(1). # in () indicates number of skeins or cards needed. 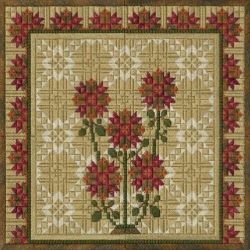 Design Area: 11.11" x 11.11" ~ Materials List: 15" x 15" 18 Ct Canvas, Sandstone ~ 15" x 15" Stretcher Bars ~ Japanese Tacks ~ #22 Tapestry Needle ~ Caron Collection Snow, 14 Mango(1 uses almost all), Caron Collection Watercolours, 137 Copper(1 uses almost all), 255 Cornflower Blue(2) ~ DMC #5 Perle, 435 Very Light Brown(1), 437 Light Tan(1), 935 Dark Avocado Green(1), 3371 Black Brown(2) ~ Rainbow Gallery Gold Rush 18, GD109C(6), Rainbow Gallery Overture, V122 Caravan(2). # in () indicates number of skeins or cards needed. 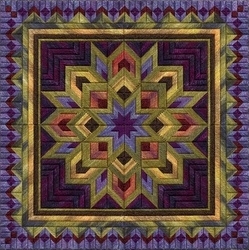 Design Area: 8.22" x 8.22" ~ Materials List: 12" x 12" 18Ct Zweigart Eggshell Canvas ~ 12" x 12" Stretcher Bars ~ Japanese Tacks ~ #22 Tapestry Needle ~ Caron Snow, 19 Icy Lavender(2), 28 Violet(3), 29 Pistachio(2) Caron Watercolours, 256 Barely Blue(1), 289 Lexi Blue(1) ~ Rainbow Gallery Overture, V61 Ocean Blues(2). #in () indicates number of skeins or cards needed.